This spring I attended the Futures thinking and foresight methodologies course where Samu Mielonen was a guest lecturer. He is strongly enthusiastic about intuition and intuitive intelligence. His presentation was very exiting and I felt that I want to hear more. 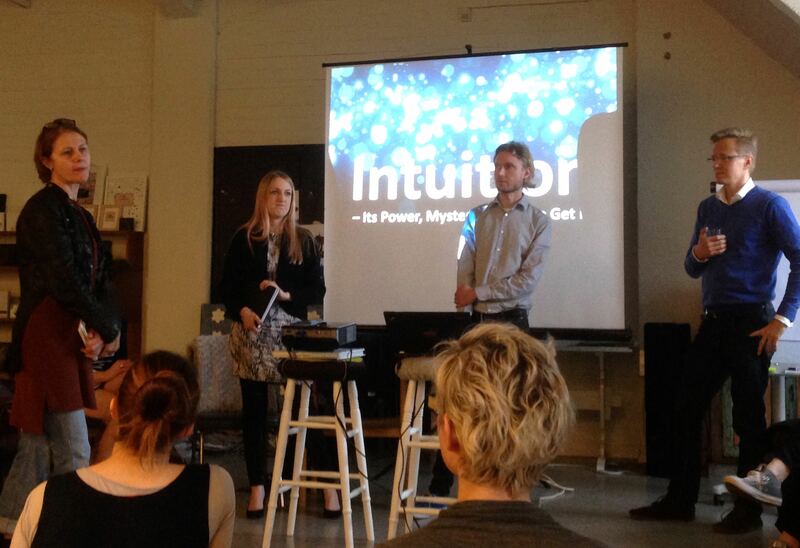 This is why I attended an evening event of Futures Specialist on the 26th of May where Samu Mielonen gave more insight into what is intuition and how to utilize it. People use many words of intuition: instinct, predictability, insight and subconsciousness. We’ve started to notice that intuition has a meaning in our way of making decisions and how our feelings create our actions. Intuition could be regarded also as a key element in service design, as it could support customer’s positive intuitive feelings. According to Samu Mielonen we have much more knowledge than we understand. We don’t use all our intuitive capabilities. We rather rationalize. I’m wondering, how to combine intuition and service design? Rationalizing in services is used when comparing prices. Intuition is strongly connected to quality perceptions and earlier experiences. It is personal and can’t be put into numbers. Could intuitive thinking be supported in service design by trust and emotional factors? As Mielonen said, we have barriers which hinder us from using our intuitive thinking. In service design these barriers and obstacles can be lowered by creating customer loyalty and strong brands. Therefore wouldn’t successful brands be the ones that support intuitive feelings? Samu presented two systems which we use: the emotional intuitive system and the rule based conscious reasoning system. The idea is that these two system constitute creative thinking which needs both systems, not only rationalizing. The intuitive system is rapid, parallel, non-linear, associative and slow learning. The conscious reasoning system is slow, linear, step-wise, deductive and changes quickly. Mielonen presented also the thought that splitting thinking into left and right brain thinking is no longer valid. Logical and mathematical thinking is seen mixed with creative and artistic thinking. I feel there is a paradox between intuition and rationalizing. Our intuitive feelings might be based on earlier intuitive experiences as well as rational experience but by time these two get mixed and our gut feeling might include “older” rationalizing. We should give more respect to our intuitive feelings because they stem from our history, both rational and intuitive experience. Intuitive feelings help us in life critical situations and when we have to react quickly. Intuition is also used when catching a ball on a football field, like Mielonen explained. Instead of calculating, we use our intuitive gut feeling. 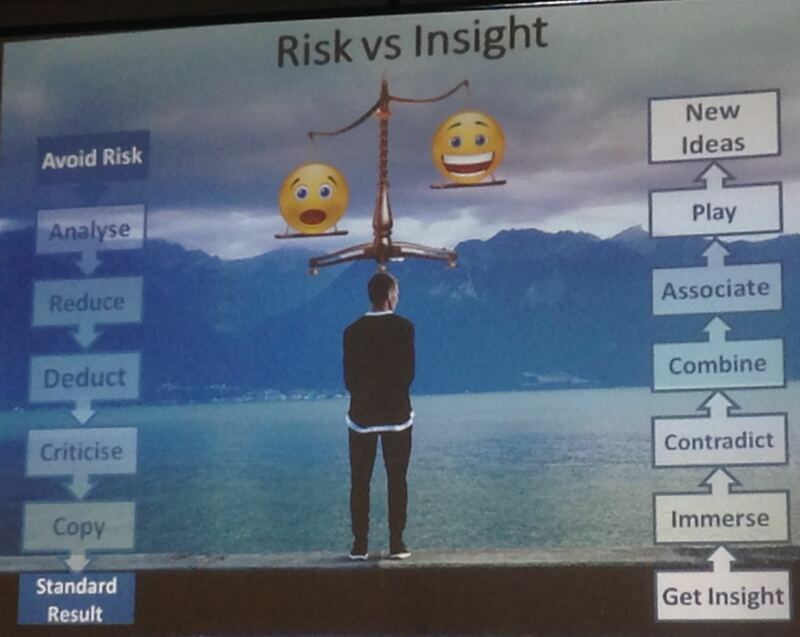 Below is a picture made by Samu Mielonen about how risk avoidance leads to standard results whereas intuition leads to new ideas. Intuition is more playful and innovative. It is merciful and leaves us the space to make decisions that we feel are our own’s. When we listen to our intuition, we are more likely to be happy. Even the mistakes we make, are our own and we can be proud of them. These same steps can be used in service design: learn and study in peace, observe, test and have fun! Intuition in service design shouldn’t be forgotten as services include emotional aspects and service itself is emotional work. The human aspect is there and so is intuition and our own ways of thinking. We should design the service process so that it supports our intuitive thinking and helps the ones avoiding risks. Customer journeys and other tools provide insight to intuitive decisions and the touchpoints where it matters most. Rational decisions might not lead to happy customers where as decisions made by intuition lead to satisfaction especially if these intuitive feelings are supported by good quality perceptions. I see that intuition is the core of our thoughts and when we notice that our intuitive feelings are right, we learn to trust them more and we learn to listen to ourselves. In service design we talk much about customer insight. We could start talking about customer intuition, something more deeper than insight. Something that people are sceptic about but what still exists. Therefore service design in its best can lead customer’s intuition towards wanted actions. In the end customers shouldn’t even notice a well planned journey of intuition: it is hidden and feels like things are just happening by themselves even though there is a lot of service design behind.